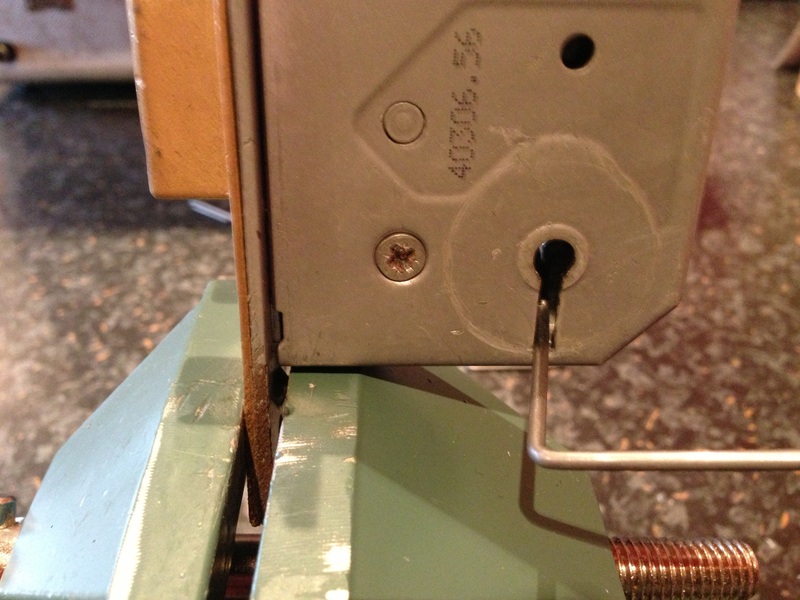 After having a struggle with a basic non curtained mortice lock a few weeks back on a warrant and having to drill the lock I thought it was time to try the island locks over lift wires for non-curtained mortice locks. 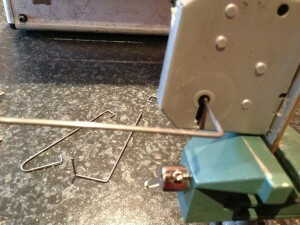 Many locksmiths will say “why the hell were you drilling a basic mortice on a warrant instead of picking?” The reason was that it was pouring with rain and the lock was tight up to a corner with a drain pipe in the way, also the lock was sat at a really awkward height and it was just one of those locks where nothing would bind using normal pick wires or a 2 in 1 pick. The lock was drilled neatly and relocked but I walked away feeling that the job was a failure as it really should have been picked. After speaking to a friend about the ease of over lifting on 3 and 5 lever non curtained locks I decided it was time to add over lifting to my bag of tricks. I looked at his 2 in 1 over lifter and although it is all self contained in one pick they have the same problem as a traditional 2 in 1 pick where by the up stand height needs to be adjusted to suit the lock which is being picked. This means that if you have to shorten the pick to suit a certain lock it will then be too short to over lift some other locks. This will result in needing lots of different over lifters all filed to different heights. Also you need them all in different gauge sizes. So to tackle this problem I decided to go with the Island locks over lift wires. Using these wires there’s no need to worry about gauge size or up stand heights making them suitable for many different locks and also a lot more cost effective. The wires are made in house by Jay Dorner who is the owner of Island Locks. After ordering bits and pieces off Island Locks in the past I was sure the quality of the wires would be spot on and I was right. After only 10 minutes practice I had opened 3 different locks all from the left hand side and the right hand side (bolt side). Anybody who has over lifted 5 lever British standard locks with a curtain ring and anti pick notches will find using these wires is a piece of cake. The technique is pretty much the same as over lifting with a curtain pick stem the main differences are that there is no stem to support the over lifter so it must be done using your fingers to support the wires and that its 10 times easier to over lift a non-curtained lock which has no anti picks than a British Standard lock which does have them. Upon first inspection of the tools I could not make sense of the 2 tension tools which come with the set. The left hand one has a huge up stand and the right hand one has a short up stand. As soon as I tried them in a lock it became obvious why the wires are set up like this. 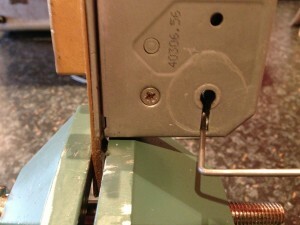 On the left mounted lock with the bolt been at the back of the lock and the levers at the front there needs to be a gap above the bottom of the wire to allow access to the levers like in the picture below. 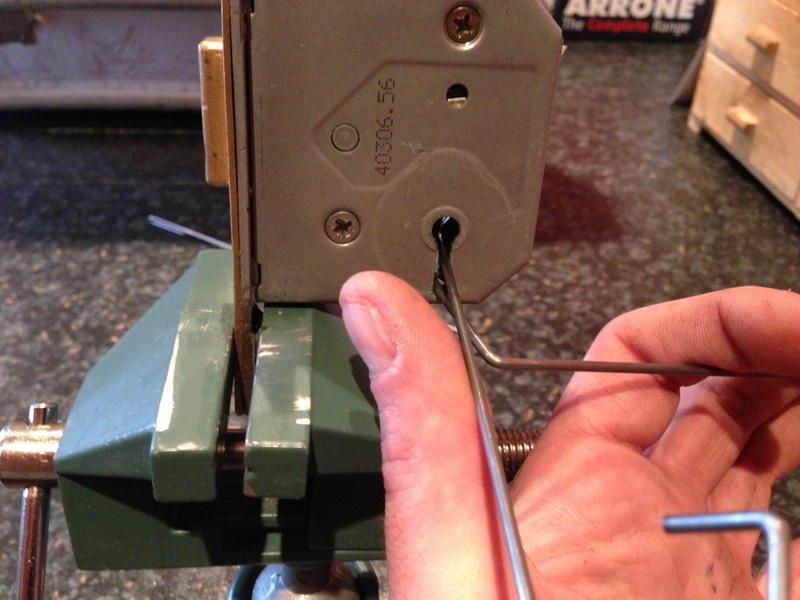 On the right hand side the wire needs to be shorter allowing you to get the over lifting pick under the tension tool because of the bolt been at the front if the right hand wire was the same height as the left hand it would be impossible to get the over lifting pick into the lock. It’s probably easier to understand by looking at the picture below. The set consists of both left and right handed tension tools and 1 x 3 lever wire and 1 x 5 lever wire. The wires are easy to tell apart the short wire is for 2 and 3 lever locks and the longer wire is for 5 lever locks. Once you have purchased the set you can also use the tension tools for normal picking as well as over lifting so they do have a dual purpose. The wires are excellent in my opinion the quality and finish are the usual you would expect from Island Locks and are really easy to use with very little practice. 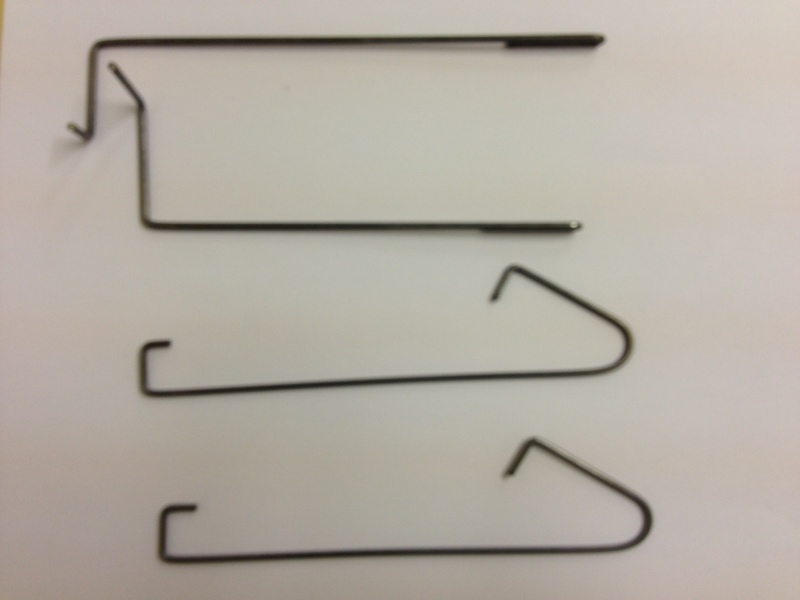 I have already used them once on site to open a sterling 3 lever from the left hand side as well as numerous locks whilst practising between jobs. These wires are a great addition to any locksmiths toolbox and I really recommend them, any tool which actually does what it says on the tin and assists in every day locksmith situations is worth it in my opinion. 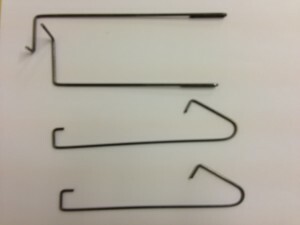 To purchase these wires please visit the Island locks tool shop. When using the over lift method try to have a finger underneath of the over lifter to allow the wire to be supported, this will stop the wire floating around and should allow the wire to make proper contact with the lever pack. When tensioning adjust tension on and off to allow the stump to find the gating, keeping a constant tension on will cause the levers which have been lifted too high to stay there preventing the lock from opening.